1. The league will be known as the Barnard Castle & District Fives & Threes League, and will consist of divisions each with a maximum of sixteen teams. Each team will appoint a captain for each match. 2. The league will hold an Annual General Meeting at which a Committee will be appointed to run the business of the League. The Committee will account to the AGM for the League’s finances. Each member team attending the AGM will have one vote. Any items for the AGM agenda must be sent to the Secretary in writing not less than 3 weeks prior to the date of the AGM. 3 The official match night will be Monday, with matches starting at 8.30pm. Matches may be re-arranged by mutual agreement of the Captains, subject to giving prior notice to the Committee. 4. All players must normally (but see rule 8) be registered with the Committee prior to playing and may only play for one team per season except where the transfer is approved by the team where the player is originally registered. Transfers can only be made once a season, and only with the approval of the League Secretary, or, in their absence, a league officer. No player under sixteen years of age may be registered. Where a player signs on for more than one team, they will become registered with the team they first play for. If a player under 18yrs old is in a team then team Captains must check if the venue they are playing at has a no under 18yrs rule. Teams must ensure that no Alcohol is supplied to or consumed by any player under 18yrs of age. 5. Each team will consist of six players playing as three pairs. Pairs will be drawn by the opposing captain, and each will play three games, with one point for each game, therefore nine points will be at stake in each match. 6. Regulations regarding illegal play are listed after these rules. Rules and Regulations must be displayed or otherwise readily available at every match played. Captains should understand and apply the Rules. 7. Each player will commence play with six dominoes, with the remaining four “back”, and the hand will end when both partners of either team have played all their dominoes, or when stalemate is reached. Each player must clearly indicate to the opposition once they have played out. At the end of each hand players are required to show all un-played dominoes. The first down of each game will be drawn for and subsequent downs will be in clockwise order round the table. 8. In the event of a team being short of players on the night, the captain may elect to retrospectively register players in order to achieve a contest for the opposition. This must be clearly indicated on the results card and the committee will consider each occasion, and may require the team captain to appear before them if the facility appears over-used. If, after that, they still only have four or five players the draw will be made as normal and two tables played, the innocent team being awarded three points for the un-played table. With less than four players the match will be abandoned, with six points going to the innocent team. The defaulting team will get no points and will have six points deducted from their records. If any team defaults on more than one occasion they will be liable to penalties including expulsion from the league at the Committee’s discretion, as will any team who fails to honour a fixture without prior notification. 9 Captains will be responsible for match procedure during all league and KO matches. Any disputes arising which cannot be settled by compromise within the framework of the rules must be brought to the attention of the Committee who shall make a decision based on the individual circumstances. 10. The prompt notification of match results and the return of the signed results cards is the responsibility of the winning captain. The required standards and methods will be set by the AGM. Failure to comply with these standards will result in a fine being imposed as determined by the AGM. 11. Any complaints etc. must be forwarded to the Committee in writing within 7 days. Each case will be dealt with according to its merits, and in all cases the decision of the Committee will be final. Illegal Play Regulations. The Preamble. A domino is deemed played once it has been intentionally released at either end. In the event of a player playing a false domino or knocking falsely, and the following player having either played or knocked, the game will be deemed to have ceased immediately. Any scores made by the error or after it will be cancelled, and the offending pair shall there-after go back eight pegs, even if this results in a minus score. The game will re­commence with the down of the next available member of the non-defaulting pair. b) elect to continue the hand with the offending domino being removed, but remaining on display. 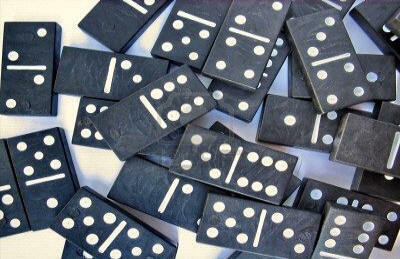 However, the decision as to whether or when to play the domino remains with the errant player. No points are deducted. 3. Wrongful display during game. b) elect to continue the hand with the offending domino remaining on display. However, the decision as to whether or when to play the domino remains with the errant player. No points are deducted. 4. Wrongful display of the dominos that are “back” during game. Any player displaying or viewing any of the four dominos that is “back” before the conclusion of the game will result in the game ceasing immediately. Any scores made after the error will be cancelled, and the offending pair will thereafter go back eight pegs, even if this results in a minus score. The game will re­commence with the down of the next available member of the non-defaulting pair. 5. Wrongful display of any dominos before the game. The game commences with a legal down. A domino is deemed displayed when one or more of the other three players has seen and recognized it. In the event of any domino being inadvertently displayed before the game has commenced, there will be a reshuffle for the same down. No points are deducted.